Spoilers ahead folks. Consider any and all filmed Stargate anything fair game, but specifically last night's episode of Stargate Universe, of course. 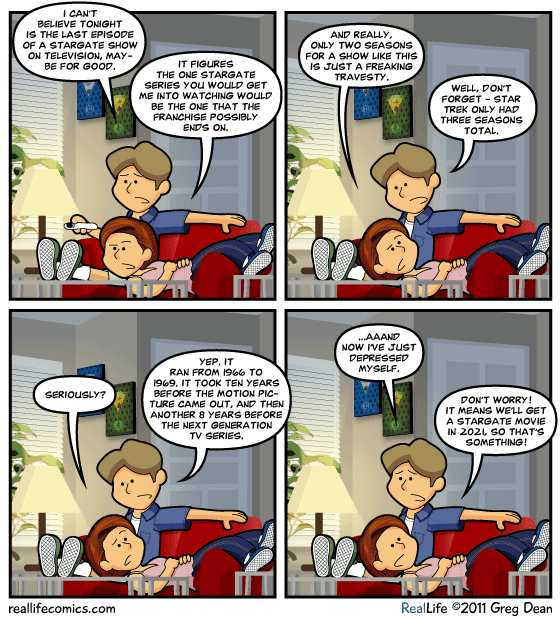 Greg Dean of Real Life Comics summed it up pretty well with yesterday's strip. I dunno, I kind of feel like Joe Mallozzi lied to us when he said the season ended on a huge cliff-hanger along the lines of the season nine SG-1 finale. I mean, don't get me wrong, the end of the episode left a lot of questions open and would have made for a tense wait for season three had we been lucky enough to receive one. But as it stands, as the series (and franchise) finale, well, I have to say, it felt like a solid goodbye. This particular series as a whole has been about facing the unknown, and with that in mind, it was a fitting ending I think. We start off the episode in the infirmary and learn, sadly, that Park's vision hasn't even begun to restore itself. T.J. is worried that the blindness may be permanent. She and Chloe have a discussion about the topic and it comes out that the whole thing just reminds T.J. that she has no way to save herself from her ALS. The disease is just lurking there in the shadows, preying on her mind whenever it isn't otherwise occupied. But she is trying, she tells Chloe, to just play the hand she's been dealt. Team Science has managed to figure out a way to detect the drone command ships so they can avoid dropping out at gated planets where the enemy is waiting for them. That's the theory anyway. The problem is that the drones are waiting at every planet with a gate between Destiny's current position and the edge of the galaxy. They can't go off the plotted course and search out planets without gates because that will only be spending their very limited resources on a huge gamble (that they can locate planets with the supplies they need), one that is unlikely to pay off. They have about a month of supplies on board, but don't want to delay the inevitable. Rush puts forward that they are just going to have to fight the ships. I know, right. Rush! Team Science explains to Young that the ship's shields normally run a constant pattern of changing frequencies. Each frequency is best suited to blocking out specific types of weapons, and while the cycling pattern allows for the ship to take many different kinds of hits during a battle, it means that at least part of any attack is going to get through when the cycle is not on the frequency that specifically keeps it out. But they know the exact frequency of the drones' weapons. So they fine-tune the shields so that it will stay on the frequency that repels the drones and drop out of FTL right on top of one of the command ships (literally). With the element of surprise and their enhanced shields, they are able to take out the ship and send shuttles down to the planet to resupply. Unfortunately this gambit cost quite a bit of power and they still took on a fair amount of damage from drones that just plowed straight into Destiny. Apparently the shields weren't fine-tuned enough to deal with that. They quickly realize that the ship cannot afford to keep doing this all the way to through the galaxy, especially since they are only about a third of the way through. So Eli decides they should just skip it. He comes up with a plan that will allow them to jump Destiny out of the galaxy sideways and then across the void between it and the next galaxy, which everyone hopes will be a bit more hospitable. Only catch is that it will take them about three years. Young points out the obvious fact that they don't have the kind of supplies for that. Eli then reveals the part of his plan where the crew uses the ship's stasis pods while they make the jump to the next galaxy. With everyone in stasis, there is no need for supplies and they can put everything in energy-saver mode, leaving them just about enough power to get where they are going and wake up somewhere (hopefully) drone-free. Rush futzes and objects to this plan. Young asks Eli how long it will take to get the pods ready and Eli tells him about twenty-four hours. Young tells Rush that he has that long to come up with a better idea. Chloe goes to talk to him (she is apparently turning into the crew's shrink as well as math-girl) and we learn that he objects to the plan because he doesn't want to miss anything they might discover about the ship's mission to find the source of the pre-Big Bang signal. He says he just doesn't want everything they have been through to be for nothing. Chloe points out that if they stay on their current course they are going to get killed by the drones, and Destiny will be destroyed right along with them. Then it all definitely would be for nothing. With Eli's plan, even if they never wake up, the ship itself will still go on. It will still be out there searching. So Rush acquiesces and gets on board with Eli's plan. The crew takes the opportunity to each take a brief visit home via the communication stones and say goodbye to loved ones. Eli's visit with his mother was particularly touching. As was Park's visit--in her borrowed body she can once more see and she drinks in the sights for all she's worth. The air on the ship is amazingly one of general cooperation and acceptance. So of course something goes wrong. Turns out the last bank of stasis pods have been damaged, probably since before the crew even boarded the ship. They can be fixed but it will require using the gates to get to a planet with the necessary materials. Otherwise they are gonna be eight pods short, and there will be no way for those eight crew members not in stasis to survive for three years if the ship is to make it to the next galaxy. Then Park has an absolutely brilliant idea (while having a very sweet and slightly heartbreaking conversation with Greer--seriously, I love these two together). They drop off one of their shuttles a short FTL hop away from the planet they need to get to, and it sends out a sub-space signal emulating an opening stargate. This will cause the command ship at the planet to go check it out, and while it is gone they can gate to the planet and get what they need then bug out. To keep the command ship distracted they use an autopilot program and reconfigure the shields to withstand the drones' attacks, the more time to buy before the command ship can go back to the planet. Eli even figures out how they can wire the shuttle to go critical, taking out the command ship with it when it blows. That was pretty groovy. Too bad they didn't just have a whole fleet of shuttles, eh? So the pods get fixed and everyone starts to go into stasis. We get some sweet goodbyes from the various couples--T.J. and Varro, Scott and Chloe, Greer and Park (with a really interesting shot from Park's perspective of her saying goodbye to Greer with Volker in the background looking on as he goes into the pod across from her). Finally it is down to Eli, Rush, and Young to make the final preparations. Then the other shoe drops. The very last stasis pod was more damaged than they realized until it was fully initialized. Uh oh. The calculations show they have about two weeks worth of minimal life support, enough for one person, before cutting into the reserves needed to ensure that Destiny can power itself to the next galaxy. (If it runs out of power, it will drift and they won't wake up for a thousand years, as opposed to three.) Rush volunteers to be the odd man out. He will try to fix the pod within the two weeks so he too can go into stasis. Young still doesn't trust him though. He can't quite make himself believe that if Rush can't fix the pod within the two weeks that he will sacrifice himself so that the rest of the crew can make it. So Young decides to be the one to stay out. Eli realizes, however, that this means that Young will definitely die, because he can't fix the pod. So Eli volunteers to stay out instead. He has a better chance of fixing the pod, and should he fail, he is willing to sacrifice himself for the lives of everyone else. So there we end, with Young and Rush in stasis and Eli the lone caretaker of the crew. The final shot is of Eli alone on the observation deck, looking out at the universe, smiling a small smile to himself. And then...the end. The obvious "cliff-hanger" here is the question of whether or not Eli was able to fix the pod in time, and if the ship did indeed have enough power to make it across the void to the next harbor. But as I said, this whole series has been about facing the unknown, and I feel like the way we leave the crew of Destiny is fitting. Granted, I would be absolutely the last person to complain if we do ever get to find out what happens next. I am really truly hoping that Fandemonium does a set of novels for SGU similar to what they are now doing for Atlantis. But if they don't, that's okay. My imagination is sailing through that void with Eli, hoping he makes it and picturing what might be next. Sure there were quite a few unresolved plot lines, but that just makes this series feel all the more real to me. They were the kind of questions we all have to face in life--unresolved romance, health concerns, basic questions of survival. The "great mystery" of the show, that of the signal for which Destiny searched, never really called to me. That was Rush's white whale, not mine. I was with the rest of the crew, hoping they could survive until they found a way back home, or barring that, could make a life for themselves on the ship they were forced to call home. I do have to say that as much as this was an ensemble cast, and as much as this show was about all of its characters...well, it really was Eli's story, wasn't it? We start with him and we end with him, and all is perhaps as it should be. David Blue did an absolutely amazing job of playing the everyman in Eli Wallace, and it was a real pleasure to watch him spread his acting wings as Eli's character grew over the two all too short seasons. So there you have it folks. The end of Stargate. The end of an era. I wish I had discovered it earlier, but if that is my only regret then it is a pale one indeed. I believe that starting in June, I am going to do a rewatch of Stargate Atlantis here on this blog for you. One or two episodes a week. I'll throw out more details as I decide on them, but I do believe that is the course I am going to take. Gotta keep the love alive, and that is how I plan to do so. I hope you'll join me.